When it comes to couple clothing, the safest bet, beyond doubt is to be all match-matchy with your man at the wedding! Although, what you should also remember is, it’s gotten a little too ‘been there done that’ - predictable, boring and tacky! If you and your guy are tying the knot sometime soon, make sure to colour coordinate your outfits with a classy twist! You don’t have to go all out, just keep it nice and subtle, for the two of you to be in sync with each other. Virat and Anushka wore beautifully coordinated outfits, in harmony with the quaint surroundings of Tuscany. 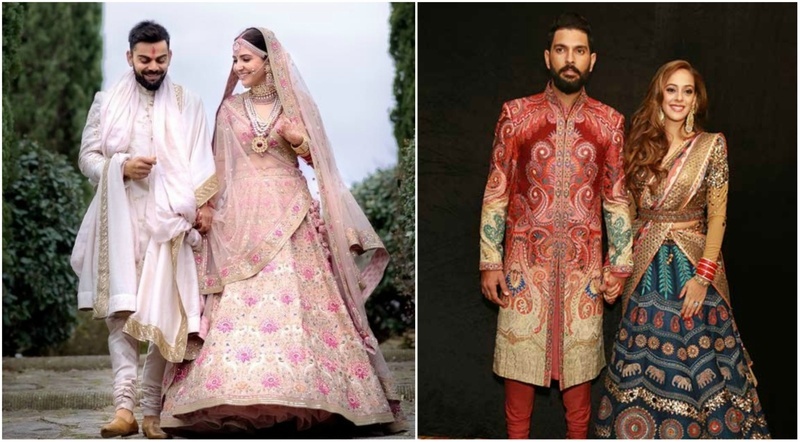 Virat’s safa and the banarasi hand-embroidery on the Sherwani complimented Anushka’s attire in the most sophisticated way ever! Just pick a color theme and then make sure to incorporate that in some way in the outfits. Looking at this couple we know that it works beautifully. This bride has matched her lehenga’s border and dupatta to the colour the groom’s sherwani making it work like a charm. This one is a very subtle yet very modern color coordination. It looks elegant and at the same time makes the couple stand out. Gold and off-white is always a classic combination, and when it's matched like this, it gives a royal vibe to it! A classic combination like this one, will never fade away. If you are going monochrome, make sure to add some distinctive feature to your bridal attire for the touch of elegance. We love how she has matched her bouquet of flowers to the groom’s suit, while the grey colour of the her attire is complementing the pale blue colour of the groom’s suit! If you are in no mood to rack your brains figuring out how to be colour coordinated with your man, you can definitely opt for this approach. This bride has very elegantly matched her outfit to the exact shade of her groom’s kurta. If you want to legit set #TwinningGoals with your hubby on the big day, then you can do what this couple did. We're in awe of how the intricate details on the bride’s lehenga and the colour of the dupatta are matching the groom’s kurta. This is a fail-proof trick to opt for similar colors for the outfit with one striking color that stands out. If too much twinning is totally not your style, then you can always match your dupatta to the groom’s outfit(in this case, also the decor). Another brilliant way to color coordinate the outfits is the combination of a bright color against a neutral color while the only thing that stands out is the embroidery. ...or coordinate the colour of your bottom wear with the groom’s kurta. Red and black colour combination is a classic, and if you wanna take it up a notch, you can have your to-be hubby include a little bit of red in this tux. This couple too seems to have taken twinning to just another level with their pastel love. The groom has matched his bow-tie with the color of the bride’s gown. Now this is what we call a perfectly colour coordinated look. Instead of going in for different hued outfits and then figuring out how to coordinate them, you can just simply sit down with your partner to decide a particular color that will suit both of you. These couples seem perfectly in sync opting for the same shade of blue. 12. Matching The Different Tones In The Outfit. Getting just one common tone in a single aspect of the ensemble seems a good idea too! This groom matched the tone of his safa with the dupatta for the bride, while the muted tones of blue are evident in both of their outfits in a very subtle manner. This combination will surely grab eyeballs. Yuvraj and Hazel matched their outfit in a very beautiful and unique way. The beige in the hem of the Yuvi’s sherwani and the beige in Hazel’s blouse, give it that dramatic look. If you’re finding yourself lost in a sea of Pinterest boards and Instagram posts searching for how to be colour coordinated with your man, take a deep breath and follow these tips!